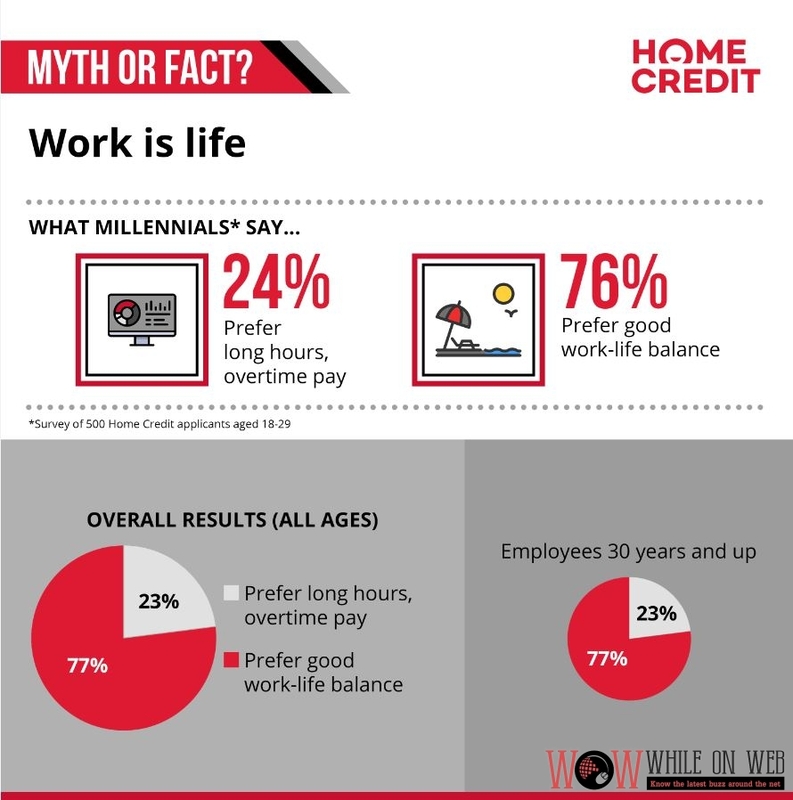 Home Credit’s HR survey reveals interesting data about tweens—and thirtysomethings, too. 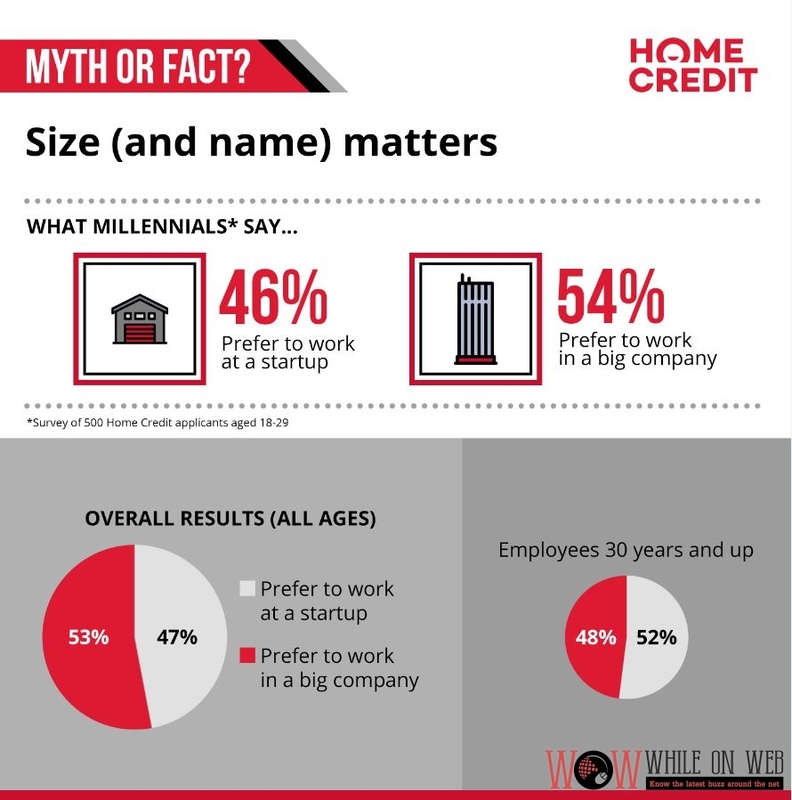 This is exactly what Prague-based fintech company Home Credit—itself an employer to more than 4,800 millennials, or 82% of the Home Credit PH workforce—did, as it recently surveyed close to 600 applicants about their career and workplace preferences (you can check out the survey here). 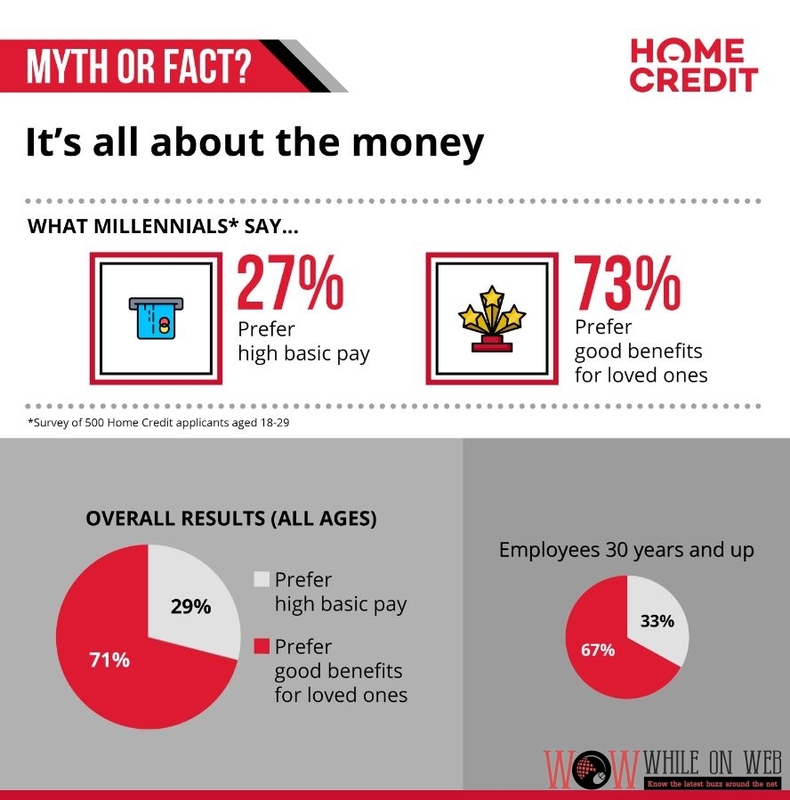 But what might be surprising is that an even higher percentage of millennials—73%– chose good benefits for loved ones over high basic pay, possibly an indicator of Filipinos’ strong family-oriented culture, even among modern millennials. Home Credit, a Prague-based company that offers in-store financing of gadgets, appliances and other goods, has been recognized by Aon Hewitt, the global talent, retirement and health solutions business of Aon plc (NYSE: AON), as a 2016 Aon Best Employer in the Philippines and in the Asia-Pacific region. The Aon Best Employers program measures and recognizes employer excellence worldwide, comparing organizations to identify those that strive to create a competitive advantage through their people and become employers of choice. Under the program, Home Credit Philippines (HCPH) was assessed on several measures, including employee engagement, leadership index, performance culture index, and employer brand index. HCPH scored high marks across all categories based on employee surveys, along with other Home Credit offices throughout APAC. “When we did our rebrand earlier this year, we said that we are transitioning from a product-focused company into a people-focused company. And by people, we don’t just mean our customers; just as important, we put even greater focus on our own people, underscoring the important role that employee engagement plays in achieving our goals,” remarked Annica Witschard, CEO of HCPH. “This award illustrates Home Credit’s strong commitment to growing together with its workforce, and we are thankful to Aon for this recognition,” she added. The months of March to May are not just associated with summer (although this is hard to ignore considering the high temperatures lately), but also graduation season. And this also means that many new grads are now busy browsing through Jobstreet or LinkedIn looking for job openings—or at the very least, trying to figure out what careers they want to pursue. But before asking yourselves which employer is best for you, you might want to ask first and foremost a more basic question—what kind of employee are you? This is a very important question to ask and answer, since all too often, employers are looking for specific qualities in applicants that will give them an edge over other job hopefuls. And what’s more, knowing what kind of employee you are can guide you on which companies or industries to look for in your job search, and increase the chances of you finding your dream job. 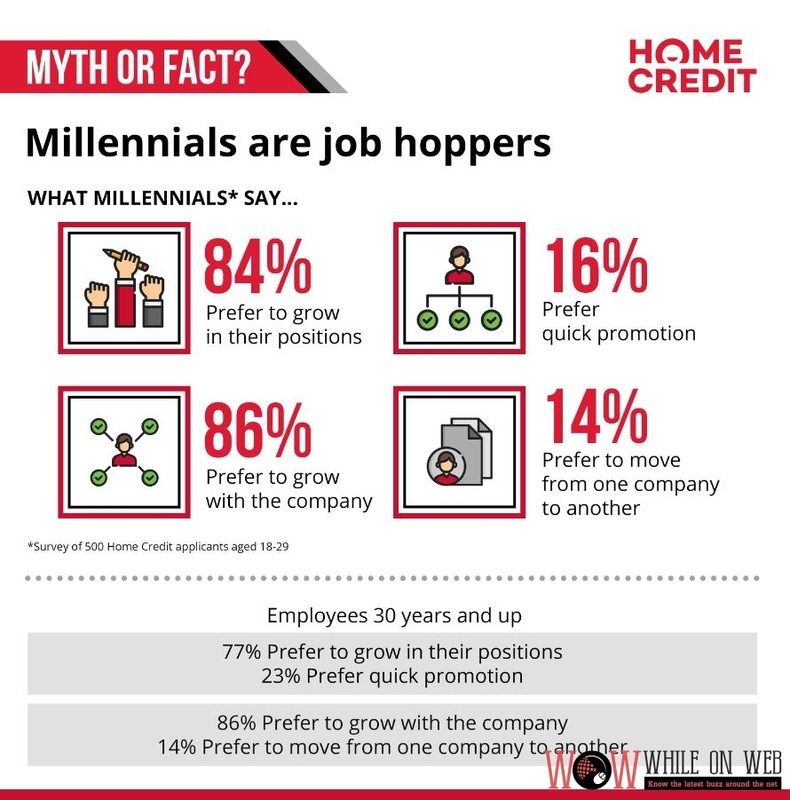 Consumer finance company Home Credit Philippines, which currently has more than 5,300 employees in the Philippines, has come up with a cool survey to help you determine what kind of employee you are. Take the nicely designed quiz here, or answer it below. The mechanics are simple: just choose between A or B! According to Home Credit, if you selected “A” more times than “B”, then you are an Achiever. You put high importance on your career, and very ambitious in achieving your personal goals. You would do especially well in a fast-paced corporate environment. On the other hand, if you selected “B” more times than “A”, then you are a Dreamer. You put great value on career success, and at the same time put great importance on work-life balance. You get along well with people, and this helps you move forward in your career. You could do very well in startups or compact companies, or even as a self-starting entrepreneur! So are you an Achiever or are you a Dreamer? Share your results in the comments section! Are we at the tail end? If one were to consult sellers, the probability of the benchmark PCOMP Index reaching “bottom” is low. So, the question remains, why are Foreign-domiciled funds still selling? The simple answer is: sellers are taking profit. Sellers are taking profit because they know that Philippine stocks cannot outperform other stock markets all the time. Thus, this opportunity to take profit now when Philippine stocks are doing well is irresistible. To recall, Philippine stocks “disconnected” from the rest of the world soon after the elections. The local stock market rallied for several weeks after elections while investor sentiment deteriorated globally. As they have in the past, traders will take profit even if they are convinced that the local stock market can outperform most other markets for most of the time. Traders will stop selling when there is little or no profit left to take, or when the local market is due for a “bounce”. If it is a question of whether the Philippines is “expensive” or “the most expensive” stock market, then no trader nor stock fund would be interested in Philippine stocks at all. “Expensive” is old news. The expensiveness or intrinsic value of a stock market is driven by the cash flow, growth and risk character of its listed-companies – not by the trading pattern or signal generated by technical analysis in charts. The intrinsic value of the Philippine stock market is higher than most other markets because of the persistent reality of stronger cash flows, higher economic growth prospects and lower risk that characterize Philippine companies when compared to many companies in most other markets. The reality is persistent because of the character of the local economy, for example the country’s demographics is in a sweet spot with most of the population in working age. “Price” is driven by the “weight” of the buy and sell flows of traders. Simply put, it is the balance of the demand and supply of shares that determine price. However, stock prices tend to “approach” their intrinsic value. The estimate of the intrinsic value of Philippine stocks by analysts now stands at 8,166, based on a survey from Bloomberg. Expectedly, as stock prices fall or become cheaper relative to their intrinsic value, demand for Philippine shares will increase. Investors who have a long-term perspective of the markets and are aware that they cannot ‘catch the bottom’ will take on the view that the current administration’s economic agenda will speak louder than the president’s unpredictable words. Investors will look at the economic agenda to find the cheapest stocks. Fortunately, the theme of ‘inclusive growth’ which aims to increase the purchasing power and improve the living standards of the majority of the Filipinos makes the most-attractive industries or sectors obvious, that is food and staples retailing, packaged foods and meats, restaurants, and multi-sector holding companies involved mostly in infrastructure. In order to avoid the predicament of waiting in the wings and remaining un-invested, investors will have to start buying before the traders stop selling. It also keeps investors from getting left behind when the stock market does “bounce”. Philam Life celebrated the year of the Fire Monkey at the heart of the Filipino-Chinese Community in Binondo, Manila where employees, agency leaders, advisors, and customers gathered at the Philam Life office on Quintin Paredes Street. “Philam Life celebrates the Chinese New Year as a gesture of solidarity and respect to this important tradition among the Filipino-Chinese community,” says Axel Bromley, Philam Life CEO. In his welcome message, Bromley expressed Philam Life’s deep affiliation with the Filipino-Chinese since its parent company, AIA, was established in Shanghai, China over 90 years ago. This continuously inspires Philam life to carry on the legacy of delivering innovative products and services to the Filipino-Chinese community and to all Filipinos. As the New Year offers more room for bigger growth, Mr. Bromley highlighted the company’s achievements for the past year and reiterated the company’s commitment to provide customers with the right plans and the right solutions to enable them to achieve their dreams. This 2016, Philam Life will build its Premier Agency through leader development and quality recruitment to grow MDRTs; beef up its bancassurance channels through BPI-Philam and AIA Citi; offer a complete suite of financial solutions ranging from protection, health, education, savings, investment and retirement to meet the real life needs of our customers; make services simpler and faster for customers through multiple payment facilities, e-billing, and other innovations; and embark on office transformation to level up customer services through modern office facilities. Part of the day’s event was the traditional eye-dotting ceremony, which cleanses and provides good luck in the area where the dragons and lions are awakened. Philam Life CEO Axel Bromley and Philam Life Chief Agency Officer Jay Ledesma led the eye-dotting ceremony and were joined by Philam Life Agency leaders.